PARIS, April 3, 2019 /PRNewswire/ -- Both have made their mark on footballing history. One has finished his career, the other is just beginning his. What unites them is love, respect for football and a remarkable destiny. Since the World Cup, an affinity has grown between the two men on social media. Today, Hublot brings them together for the very first time, marking a passing of the baton and a moment of recognition between the greatest player of all time and the most promising hope in world football. 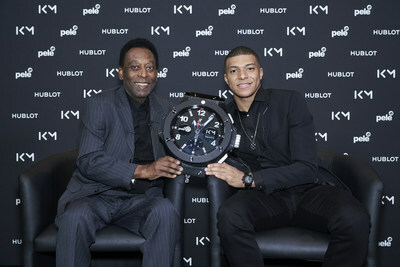 King Pelé, a Hublot ambassador since 2013, has crossed the Atlantic to meet Kylian Mbappé, the watch brand's newest ambassador, for a truly historic and moving encounter. "The generosity of Pelé and Kylian can be seen in their eyes, as can their love of football. This flame, this inextinguishable strength, is what drives these two great champions. They are inspiring new generations of footballers and writing the history of football, so it was perfectly natural to bring them together. Having them in our family is a great source of pride and pleasure, because before being football stars, they are above all great men who command respect." "I am honoured to have the opportunity to personally meet Kylian. He embodies the new generation of footballers and espouses the values of a sport that inspires and unites the world. I am happy that he symbolises hope; the hope that anything is possible, for the dreams we must believe in and fight for, regardless of our origins or our social status. For me, the key to success can be captured in two words: humility and perseverance. That is the message that the new generation must convey, and Kylian has perfectly understood this." "I have learned that the biggest stars and the best players are the most humble and respectful, those who are able to keep their feet on the ground. 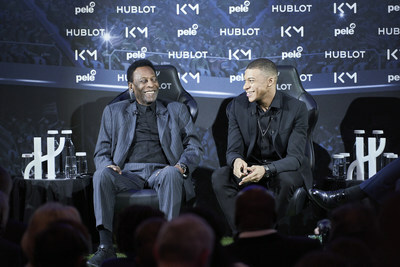 Respect, humility and lucidity are values that my parents passed down to me and they are values that I am proud to now share with my adopted family, Hublot, and King Pelé, who perfectly embodies what my parents have always taught me —to be a great footballer, you must first and foremost be a great man." 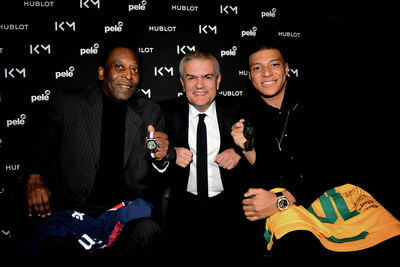 Hublot opens a new chapter in footballing history by bringing Pelé and Kylian Mbappé together for this momentous encounter. The paths of these two men show uncanny similarities. Is this chance, or fate? There are 60 years between Pelé's first World Cup and that of Mbappé. However, the impact of these two players on the history and love of football remains absolute. Pelé and Mbappé are two timeless, devoted and esteemed symbols of the world's most unifying sport, two generations with shared values: Humility, Generosity, Perseverance. A sign of fate: Kylian was born in 1998, the year that marked France's historic victory against Brazil in the FIFA World Cup. An outstanding athlete who makes people smile, Mbappé is also generous, donating all of his match bonuses to the charities he sponsors. The man they call "37", thanks to his top speed recorded at the World Cup, truly makes the world dream. The only current player among Hublot's Football ambassadors, Kylian Mbappé will play a decisive role in the watch brand's communications. Deservedly famous, he takes the top ranking! 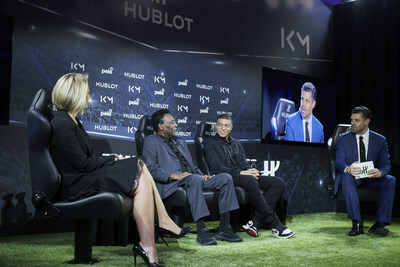 HUBLOT is fully committed to creating a Haute Horlogerie brand with a visionary future: a future which is fused with the key events of our times (FIFA World CupTM, UEFA Champions League™, UEFA EUROTM and Ferrari) and the finest ambassadors our era has to offer (Kylian Mbappé, Usain Bolt, Pelé).